As a vital piece of equipment, your plate and frame heat exchanger needs to be protected. Among the most important factors to consider when ordering a plate and frame heat exchanger is to ensure that it will be compatible. For this reason, it is vital to check with your manufacturer to make certain that that chemical compatibility exists between your process liquids, any other potential cleaning solutions and your heat exchanger components. An excellent case in point involves the presence of 316 stainless steel. Many plate and frame heat exchangers feature 316 stainless steel plates. While this type of stainless is known for being resistant to corrosion and compatible to numerous types of chemicals commonly used in processing plants, it is not compatible with chloride. 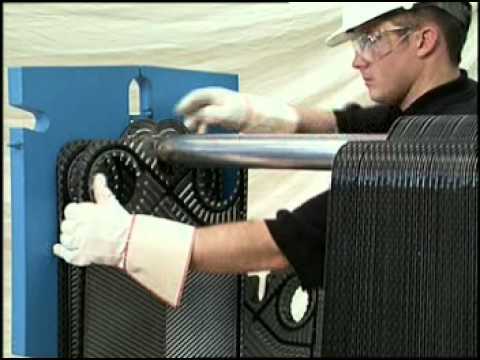 In the event that your plate and frame heat exchanger is used with a cooling tower and you are considering changing to a chemical that is more aggressive as part of your treatment program, remember that it is a good idea to consult with your plate and frame heat exchanger manufacturer to determine whether it is compatible with gaskets and plates. This can also be true if you utilize a clean-in-place process, which usually involves the circulation of a caustic cleaning solution through the system. In such instances, it is important to be certain that the cleaning solutions used are compatible with the gaskets and plates of your heat exchanger. If you are not certain, be sure to check with your manufacturer. It is also important to avoid situations with your plate and frame heat exchanger in which pressure spikes might take place. While manufacturers do typically make allowances within the design, it is vital that the pressure limits as noted by the unit's rating are not exceeded. Possible remedies for preventing such pressure spikes from taking place include arrestors, pulsation dampers, rupture discs, and relief valves. As a general rule of thumb, it is easier to prevent a leak from occurring within a plate and frame heat exchanger than stopping it once it has started. For this reason, it is important to check the frame integrity and plate pack dimension on your unit periodically.